ASSASSINATION OF THE PRESIDENT AND THE SECRETARY OF STATE! President Lincoln was shot last night, and died this morning at 7 30! 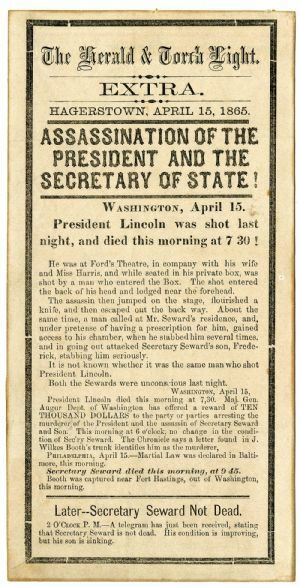 He was at Ford’s Theatre, in company with his wife and Miss Harris, and while seated in his private box, was shot by a man who entered the Box. The shot entered the back of his head and lodged near the forehead. The assassin then jumped on the stage, flourished a knife, and then escaped out the back way. About the same time, a man called at Mr. Seward’s residence, and, under pretense of having a prescription for him, gained access to his chamber, when he stabbed him several times, and in going out attacked Secretary Seward’s son, Frederick, stabbing him seriously. It is not known whether it was the same man who shot President Lincoln. Both the Sewards were unconscious last night. PHILADELPHIA, April 15.—Martial Law was declared in Baltimore, this morning. Secretary Seward died this morning, at 9 45. Booth was captured near Fort Hastings, out of Washington, this morning. 2 O’CLOCK P. M.—A telegram has just been received, stating that Secretary Seward is not dead. His condition is improving, but his son is sinking.